Client Abdul Latif Jameel Lands Co. Ltd.
Hayy: Creative Hub project is located in Jeddah, Saudi Arabia and expands over 7,653 sqm. The Creative Hub is composed of one underground parking floor of 129 parking spaces and three floors of galleries spaces, offices, restaurant and multi-purpose areas. It hosts art exhibitions, artists’ studios and various cultural events. Systematica was appointed to carried out a comprehensive study both on the pedestrian circulation and on the vehicular circulation for drop off/pick up and parking areas in order to list recommendations and guidelines for baseline and improved layouts. 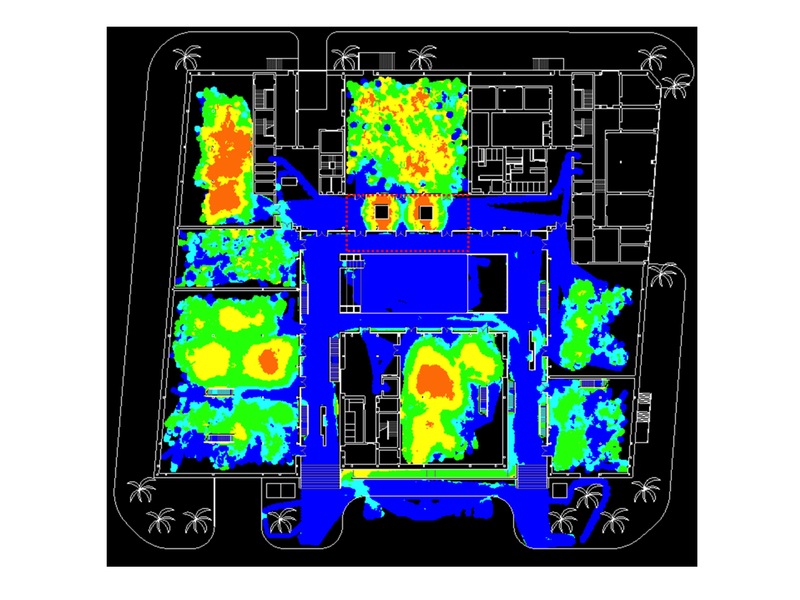 The pedestrian circulation analysis started with a Spatial analysis that measured the levels of visibility and accessibility within the floors circulation. Then, pedestrian simulation models were curried through the Legion SpaceWorks® software which simulates the movement of pedestrians in a quantitatively verifiable manner. The different levels of pedestrian demand were estimated by Systematica using assumptions related to the duration of stay in the different spaces. The pedestrian models result led to a list of recommendations to ensure sufficient space for people walking or standing in exposition areas with a high level of comfort and safety. The vehicular accessibility analysis focused on the parking entrance/egress point and the internal circulation of the parking floor. The internal circulation analysis suggested different circulation proposals based on the parameters of safety achieved by avoiding conflicts at turns and the flexibility granted in reaching the parking slots. Furthermore, the drop-off in front of the main entrances was tested through the Auto track® software. People movement analysed and models led to a list of recommendations to ensure sufficient space for people walking or standing in exhibition areas with a high level of comfort and safety.